We have developed unique 3, 5 and 7 day car tour itineraries that give our clients a chance to see several Morocco highlights in a shorter time frame. And of course, any of these itineraries can be customized to your specific needs. Please contact us for more information on these tours or to have us customize one for you. Highlights: scenic drives through the Atlas Mountains, camel trek, sleeping in the Sahara, Todra Gorge, UNESCO site Ait Benhaddou and other kasbahs. Day 1: Drive from Fes to Midelt City. We will pick you up from your hotel after breakfast and spend the next few hours driving through the Middle Atlas mountains passing through several scenic mountains towns along the way. Some highlights include passing through quaint ski resort town of Ifrane and seeing the barbary macque-inhabited cedar forests. We'll pass through a few other other small towns such as Boulaajoule and Zaida before arriving at the hotel in Midelt. 4 hour drive. Day 2: Drive from Midelt to Erg Chebbi in Merzouga region (Sahara Desert). We will head southeast across the Middle Atlas and eastern part of High Atlas traversing through the amazing Ziz Valley. You will have gorgeous views over dom in the foot of eastern High Atlas mountains in Errachidia province. After lunch in Arfoud town we'll drive via Risani to the hotel where we will start your camel trek to your Sahara Desert camp. 3 hour drive and 1 hour camel trek. Day 3: Drive from Merzouga (Sahara) to Todra Gorges. We will depart early from the desert and will catch the sunrise as we travel to the hotel for breakfast and a shower. Then we will drive to Todra Valley where we will have a picturesque walk along the river in the palm groves and the will enjoy the natural beauty of the Todra Gorges. We will overnight at a hotel in Todra Valley. 4 hour drive. 1 hour walk . Day 4 : Drive from Todra Gorges to Ait Benhaddou. Today we will have a nice drive through Tinghir City, Boumalne Dades and Rose Valley. This is a fertile valley for agricultural products such as wheat, barley, corn and alfalfa and the Rose Valley is known for it's locally produced "rose" cosmetics such as rose water, perfumes and creams. This area is also known as "The Valley of a Thousand Kasbahs" for the many Berber Kasbahs in the area. We will make a stop at the main door of the desert, Ouarzazate city which is known as the Hollywood of Morocco, since it is a popular international film making location. Then we will head to the UNESCO World Heritage site of Ait Benhaddou. Overnight in hotel . 4 hour drive. Day 5: Drive from Ait Benhaddou to Marrakech. After breakfast, we will drive through Ounila Valley at the foot of the High Atlas Mountains and will enjoy wonderful views of the Telouet region. We will then have the chance to visit the stunning Kasbah de Telouet that was built by former Berber government official, Thami El GLaoui, who was pasha of Marrakech. We will then head across the Atlas Mountains via the famous zig-zagging Tizi N'Tichka Pass. And drive through the Al Haouz plain as we approach Marrakech. 6 hour drive. - Two dinners are included. - Camel ride, overnight in Berber camp. 2 people: 660 € per person in private tour. 4 people: 630 € per person in private tour. 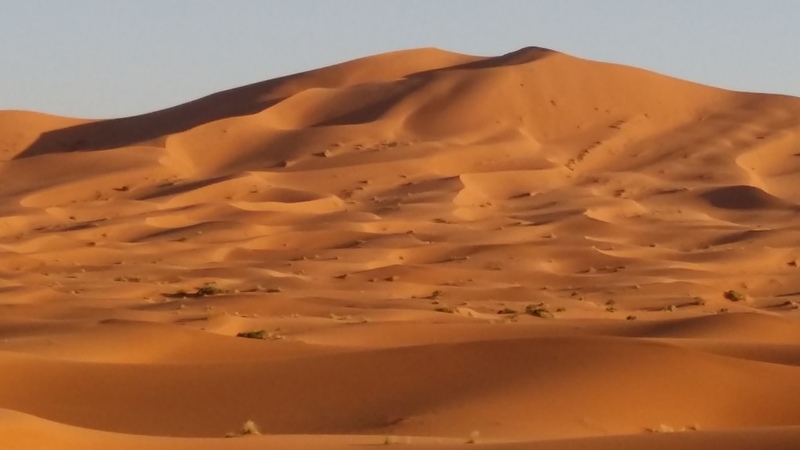 Highlights: scenic drive through the Atlas mountains, UNESCO site Ait Benhaddou kasbah and other kasbahs, Ouarzazate, palm grove oases, camel trek, sleeping in the Sahara and visit to Todra Gorges. Day 1: Driving from Marrakech to palm grove oasis in Soura. We will pick you up from your hotel or airport in Marrakech and then start our scenic drive through the High Atlas that includes crossing the zig-zagging Tichka pass at 2260 metres. Along the way we will see the picturesque Berber kasbah built by Pusha of Marrakech and we will visit the famous Ait Benhadou kasbah (UNESCO World Heritage Site). After lunch, we will drive to Ouarzazate which is known as the Hollywood of Morocco, since it's studios have filmed many international movies such as The Gladiator. We'll also have the chance to see Taourite kasbah, situated in the centre of Ouarzazate city. Then we will arrive at our hotel in the palm grove oasis town of Skoura. 6 hour drive. Day 2: Skoura to Merzouga sand dunes (Sahara). This will be a day filled with beautiful scenery so you can expect to take hundreds of photos. We will hit the road after breakfast and have the chance to see some ancient Berber Kasbahs as we pass through the Rose Valley towns of El kalaa Mgouna and Boumalne Dade. We will make a stop to visit the stunning Todra Gorges in Tinghir province. We will have lunch in the quaint town of Tinjdade before heading toward the desert. Along the way we will pass the desert perimeter towns of Touroug, Jourf, Arfoud and the last town of Risani. 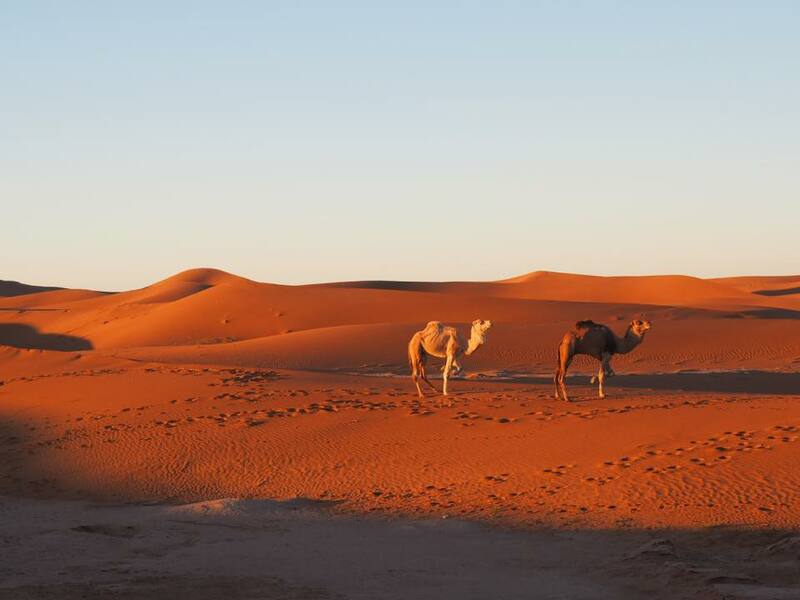 When we arrive in Merzouga, we will go for a camel ride and then spend the night in Berber tents in the middle of desert. We will watch the sunset over the dunes and the star gazing will be amazing. (Erg Chebbi sand dunes). 7 hour drive. Day 3: Merzouga to Marrakech. We recommend waking up early so you can see the sunrise and get some incredible pictures. After sunrise, we'll ride the camels back to the hotel to take a shower and have breakfast. We'll head out of the Sahara the way we came via Risani, Alnif, Ouarzazate, and the same way through High Atlas mountains. We'll take many photo breaks and will stop for lunch. Today is a long driving day, with an approximately 9 hour drive. - Riding camel, Overnight in Berber camp. 2 people: 340 € per person in private tour. 4 people: 310 € per person in private tour. 6 people: 280 € per person in private tour. Highlights: scenic drives through the Atlas Mountains, camel treks, sleeping in the Sahara, Todra Gorge, UNESCO site Ait Benhaddou and other kasbahs, palm oasis, seaside town Essaouira. Day 1: Marrakech to Ouarzazate. After breakfast, we will set off to the Marrakech plaines and then cross the High Atlas Mountains via the windy roads of Tichka pass (2262 metres). We will enjoy amazing views as we drive through the Atlas mountains. We will then arrive at the UNESCO World Heritage Site, Ait Benhaddou and explore this fortified city that was a popular caravan stop. We'll have lunch in the area and then drive a short distance to our hotel in the picturesque "Hollywood of Morocco" Ouarzazate. 6 hour drive with lots of stops. Day 2: Ouarzazate to Tamtatouchte Valley. After breakfast we will drive through several Rose Valley towns (El Kalaa Mgouna and Bomalne Dades). This valley is known for the locals' production of many rose-related items such as perfumes, rosewater and rose oil. After we pass through this valley we will arrive at the famous Todra Gorges which sit at the foot of the High Atlas Mountains. We will take some time to walk through this beautiful canyon and then we'll drive to our hotel in Tamtatouchte Valley. 5 hour drive with many photo stops and lunch. Day 3: Tamtatouchte Valley to Merzouga sand dunes (Sahara). Today we head east towards the Sahara Desert. Along the way we will see the incredible landscapes of the High Atlas Mountains and will pass through several Berber villages such as Ait Hani, Amlagou village and Goulmima. After lunch in Touroug, we will drive throughout more small towns including Risani which is the last town before the sand dunes (Erg Chebbi). At end of day, we will have 1 hour of camel trek to the desert camp and will see the sun set in your way to camp. 6 hour drive and 1 hour camel ride. Day 4: Merzouga to Nkob. We will wake up and ride our camels back to the hotel where we will shower and have breakfast. Today we will pass though several Berber villages such as Tazarine and Nkob which are home to the Ait Atta tribes originally from Saghro mountains. We will spend the night in beautiful Berber Kasbah set in a palm grove with amazing views. 6 hour drive . Day 5: Nkob to Taroudant (Little Marrakech). Today's drive will take us through the beautiful Draa Valley where we can see the palm groves nourished by the Draa river. We will then cross the Anti Atlas mountains passing by several more villages including Taliouine, which is known for growing saffron. We will then arrive in the agricultural region of Taroudant and spend the night in a beautiful hotel there. You will have the option to eat a delicious Moroccan dinner in a local Riad. 7 hour drive with stops for good pictures and picnic lunch. 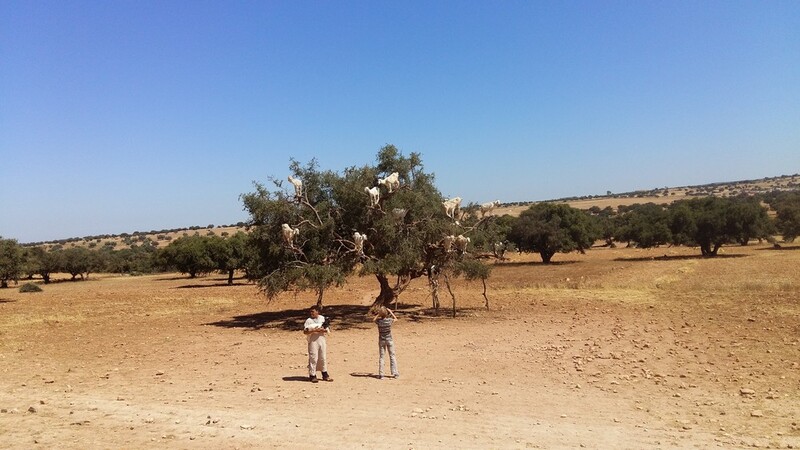 Day 6: Taroudant to Essaouira. We will depart Taroudant and head for the coast, passing through Agadir and Taghazout beach enroute to Essaouira(Mogador). Once we arrive in Essaouira, we will have time to explore the charming old medina and/or visit the beautiful beachfront. This old Portuguese port offers many waterfront activities such as swimming, horseback riding or surfing. This is a great place for seafood lovers to try different types of fresh fish. We will overnight in hotel. 5 hour drive. Day 7: Essaouira to Marrakech. Our tour will conclude with a short drive to Marrakech passing through a few quaint towns like Sidi Lmakhar, Chichaoua and then Tansift plaines. Upon arrival in Marrakech, we can either drop you at your hotel or to the airport,depending on your plans. 3 hour drive. 2 people: 780 € per person in private tour. 4 people: 730 € per person in private tour.